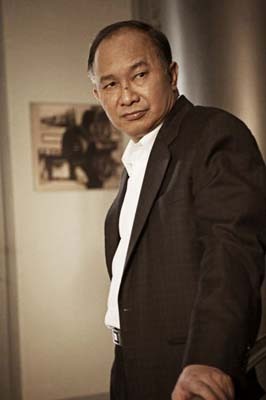 A file photo of Hong Kongg director John Woo. John Woo's longtime partner and friend Terence Chang on Sunday released a statement to reveal that the Hong Kongg director has a tonsil tumor, while dismissing a rumor that he was afflicted with throat cancer. "There are many false reports online regarding director John Woo's illness," Chang said in the statement released to media. "Mr. Woo is always low key and doesn't want to explain further, so there come lots of misunderstandings." He continued, "I want to address the issue straight right here, and clarify it to any family members and friends who are concerned. Director Woo didn't have heart disease, throat cancer or pancreas cancer. "Actually early this year, a tonsil tumor was found on him, so he received an surgical operation to remove it in Taipei, and the treatment was finished before Chinese lunar new year, then he went back to the United States for recovery. It was false to say he was hospitalized in the U.S. for four months." Reports in the Chinese media had previously claimed that Woo was suffering from throat cancer and has been receiving treatment in the U.S. ever since doctors discovered the disease. Sources said the director fell ill while preparing to shoot "Love and Let Love" in January and that he postponed the project. "He is currently receiving treatment in the U.S. and at best may return home and continue working by the end of the year," one source said Saturday. "Things are looking much better now." Chang explained Monday that Woo delayed the filming of "Love and Let Love" to have rest and receive care, with consent of the film's investors and cast. But due to various actors' schedule conflicts as a result of the delay, the film was put off until next year. The lead actors, including Chinese mainland actress Zhang Ziyi, Korea's Song Hye Kyo and Taiwan's Chang Chen in the mean time all started working on other projects. "Love and Let Love," dubbed China's "Titanic," is based on the true story of the Taiping steamer that sunk after colliding with a freighter carrying coal and timber en route to Taiwan in 1949, claiming about 1,000 lives. Besides "Love and Let Love," John Woo has more pending film projects ahead, including a China-U.S. co-production "Flying Tigers" and a remake of the 1967 French classic "Le Samourai," originally made by Jean-Paul Melville. According to Hollywood Reporter, John Woo will also direct "Day of the Beast," a remake of Seijun Suzuki's widely celebrated 1963 film about the Japanese mafia. Woo and Terence Chang's Lion Rock Productions will produce the movie in cooperation with Nikkatsu Corporation, home of Suzuki's "Youth of the Beast." The English production was announced as Nikkatsu, Japan's oldest major movie studio, celebrates its 100th Anniversary this year. "This remake is my salute to the great films and filmmakers produced by Nikkatsu's 100 years in cinema. It is exciting for me as well as a true honor," Woo said in a statement to announce the project at the 2012 Cannes film festival, held from May 16 to 27. Set in Tokyo, "Day of the Beast" follows a Western outsider with a grim past as he becomes embroiled in a global turf war between the Yakuza (Japanese mafia) and several old-school Cold War Russian mobsters. Actress and model Lin Chi-ling, who starred in Woo's epic "Red Cliff," stated Friday that she had been aware of Woo's illness for some time. "He is my senior, one I respected, like a parent. I pray for him every day," she said.